Boost Mobile today announced the LG Volt 2 and LG Tribute 2, updates to two of last year's big sellers for the prepaid carrier. Both devices share several hardware features, such as LG's signature rear-placed buttons, 1.2 GHz quad-core processors, LTE, Bluetooth, and WiFi. They also boast similar software, such as Android 5.1 Lollipop with LG's Knock Code, QuickMemo, and selfie camera tools. Volt 2: The second-generation Volt (pictured) improves the screen from a 4.7-inch qHD display to a 5-inch 720p display. The main camera has an 8-megapixel sensor and the front camera has been improved from 1.3 megapixels to 5 megapixels. It has a 2,540mAh battery. Tribute 2: The less expensive of these two handsets keeps the screen at 4.5 inches, but improves resolution from 800 x 480 pixels to 854 x 480 pixels. The 5-megapixel main camera, VGA front camera, 1 GB of RAM, and 8 GB of ROM are carried over from last year's phone. It has a 1,900mAh battery. The LG Volt 2 and Tribute 2 are available from Boost's web site beginning today. The Volt 2 cost $149.99 and the Tribute 2 cost $99.99. This low-cost Android smartphone targets the budget buyer with its entry-level specs, but the LG Tribute 2 is hardly an upgrade from last year's model. Find out if we recommend the Tribute 2 in this full review. The Volt 2 finds the middle ground in Boost Mobile's assortment of Android devices. The Volt 2 is slightly improved over last year's model, and could be the right side for the phablet averse. LG used Mobile World Congress 2015 to kick off its new range of mid-tier devices. The Magna, Spirit, Leon, and Joy bring LG's high-end design aesthetic to affordable price points. 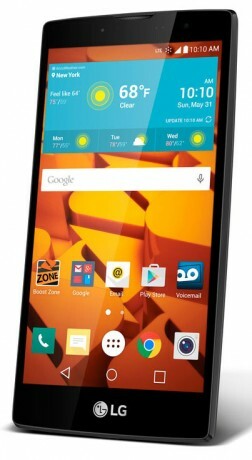 Sprint today announced the LG Tribute 2 is now available from Virgin Mobile and Sprint Prepaid. The Tribute 2 has LG's signature rear-placed buttons, 1.2 GHz quad-core processor, LTE, Bluetooth, and WiFi. LG today announced four new smartphones that target the middle of the market. The devices will run Android 5.0 Lollipop with LG's user experience, and are named the Magna, Spirit, Leon, and Joy.